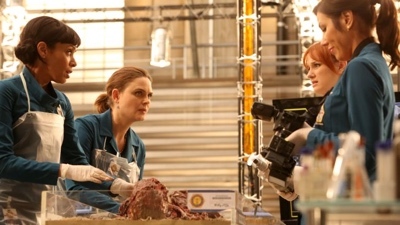 The Jeffersonian investigates the murder of a convicted felon who had been released to a halfway house, but disappeared, and a suspect in the case has ties to Booth. Meanwhile, Brennan testifies at an FBI hearing about the circumstances regarding her assault of an unarmed suspect from a previous case, and the outcome of the hearing could lead to her suspension and prevent her from working with the FBI. Aubrey and Jessica’s first kiss is delayed again and Hodgins continues to push Angela away.